Welcome to Upper Slaughter, the tranquil Cotswold village, located in the north-east corner of Gloucestershire, and to the web development & IT support portal. To fully appreciate the village and the surounding countryside one needs to experience it throughout the seasons and preferably over an extended period. It is safe to say that those of us lucky enough to live here are indeed fortunate. The natural beauty of Upper Slaughter is well documented, both by those that have visited the area and by those that have merely read about it. However, it has many other claims to fame, including the fact that it is one of the “Thankful Villages”. The phrase Thankful Village was first used by Arthur Mee in his King's England series in the 1930s. It was said to be one which had lost no men in the Great War because all those who left to serve came home again. Mee’s initial research identified 32 villages, although subsequent work extended this number to 51 parishes throughout Britain. 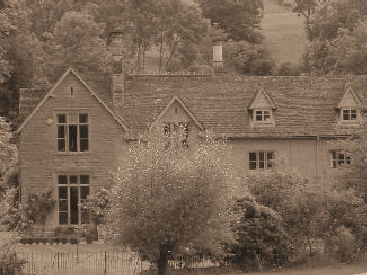 Upper Slaughter was indeed blessed as it was able to lay claim to the same feat in the Second World War too. Upper Slaughter is situated three miles south-west from Stow-on-the-Wold and two miles north-west from Bourton-on-the-Water. It is an ancient parish of some 1,851 acres and is irregular in shape, stretching from the River Windrush to the River Dikler. The parish was enlarged in 1883 by the addition of two separate parts of Lower Slaughter; one being 144 acres of Fir farm on the north-east side and 8 acres of Aston Mill in the south-west. 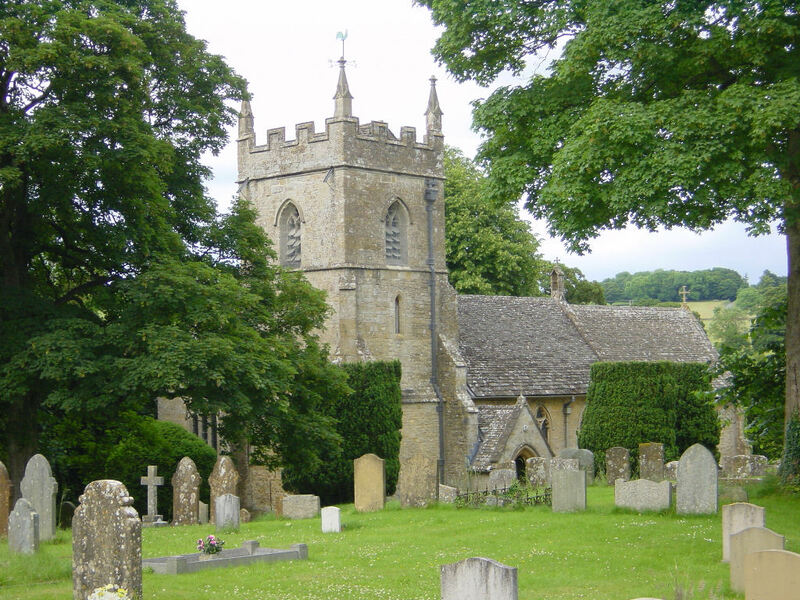 It was further enlarged in 1935 with just over 1,200 acres of Eyford parish being added to it. Before these changes the boundary between Upper Slaughter and Eyford followed the Ey, or Slaughter brook, downstream to a point quarter of a mile north of the road from Stow-on-the-Wold to Gloucester, and then cut across open land and the road to the Ride plantation and followied the general line of it back to the road, which formed part of the rest of the boundary. The land of the parish lies roughly between 450 feet in the river valleys and 750 feet in the northern area; there are many sharpe hillsides and few stretches of level ground in the parish, which is divided through the middle by the Slaughter brook, winding through its deep and narrow valley. The lower land of the parish is on the Middle and Upper Lias, the higher land on the Oolite and Chipping Norton Limestone. The soil varies greatly from field to field, in depth and composition: on the exposed uplands it is thin and stony. Nearly the whole parish is open farm-land, divided up more by stone walls than by hedgerows, and except for Long Plantation in the north, a postinclosure plantation probably of the 18th century, and the park made at Copse Hill in the 19th century there is no extensive woodland. The parish was crossed by three ancient roads, the Stow-on-the-Wold to Gloucester road (turnpiked in 1755), Buckle Street, near which are remains of two round barrows, and Ryknild Street (locally called Condicote Lane), which disappears from sight shortly after entering the parish. The route from Bourton-on-the-Water to Condicote seems to have been diverted through Upper Slaughter, so that there was no need to keep the southernmost stretch of Condicote Lane open. Romano-British burials on Copse Hill and Becky (or Beggy) Hill, on either side of the Slaughter brook, may indicate a settlement in Upper Slaughter, an offshoot perhaps of Bourton, but there is no evidence of post-Roman occupation until the 11th century. If the name Slaughter was used of the ford near Lower Slaughter before it was used of either village it is likely that Lower Slaughter was the earlier settlement, from which Upper Slaughter was later founded. The supposition that Upper Slaughter castle mound was built to resist the Danes has no foundation in fact. The castle was built with a flat-topped mound, of which the top seven feet were made-up soil, above an irregular bailey from which the ground dropped to the Slaughter brook on the north and to a moat on the east. Excavation in the moat has produced 12th- and 13th-century potsherds, and it is likely that the castle, which is not in a commanding position, was built for purely local defence, and was used only for a short period. Any possibility that the king's sergeant in Slaughter in 1190 and 1239 was connected with it is made remote by the complete absence from the Pipe Rolls of the late 12th century and early 13th of any reference to a castle or defensive works in Slaughter. The sergeant was presumably connected with the royal manor in Lower Slaughter, and the prison, which would certainly have been part of any royal castle, was in Lower Slaughter. The castle mound is on a bend in the Slaughter brook, and on the shoulder by which it is connected to the hillside behind stands the church (apparently older than the castle), with the village straddling the shoulder. Northwards the houses have crossed the brook and follow it downstream; to the south the building of small houses has been inhibited, and some houses have been pulled down, because the two big houses of the village are there. The manorhouse, on the site of the 14th-century capital messuage, the Well Place, which may have given its name to Richard Atwell, lord of the manor, closes the village on the south; between it and the village centre is the former parsonage house known as the Manor (as distinct from the manor-house) since 1875, when a new rectory was built on the northwest corner of the village. This second rectory became known as the old rectory in 1955, when the Church Commissioners sold it, in 1961 was known as 'The Way's End', but has since returned to the 'Old Rectory'. The village centres on an open square which is joined at one corner to the churchyard. The square may have been larger and extended alongside the churchyard until a messuage on its edge was developed, and perhaps enlarged, as a group of cottages in which paupers were housed and which was known up to the 20th century as Bagehott's Square. In 1693 a barn there, already used as a house, was made habitable, and the number of houses there began to grow soon after until it was 11 in the early 19th century. In 1859 privies and a bakery were added; in 1873 it was agreed that the houses should be tidied up and one house pulled down to make more room; and c. 1908 the whole of Bagehott's Square was remodelled as eight cottages. Roads lead from the square south to the manorhouse and west to join the road leading one way to Naunton and the other to Bourton. The course of the road to the manor-house was moved in the late 18th century to give more privacy to the rectory. The roads leading north and east out of the square to encircle the castle mound had each a bridge across the brook by 1738. The general direction of these and other minor roads and tracks in the parish had been established by 1731. Before the inclosure of the parish in that year there were no buildings away from the village, and the dispersal of farm-houses afterwards was gradual. Wales Barn was built fairly soon after inclosure but did not immediately become a farm-house, and Kirkham Farm was the only outlying house to be built in the 18th century. Hill Farm was built in the mid-19th century to replace the old rectory farm west of the parsonage house, and in 1872 the large house and farm buildings at Copse Hill were begun. In 1910 Manor Farm with two cottages was moved a mile south-west from the original site near the manor-house, and in 1961 only two of the farm-houses in the village were used as such. Keep an eye out for the Abattoir Club - its next event will be Saturday 31st July, featuring Ian Shaw. Previous events have included the fabulous Gwyneth Hertbert. The Parish Council meets the .... each month, or where a specific matters needs an earlier review. This year's fete will be held Saturday 3rd July. In aid of St Peter's Church.